Published: April 24, 2015 at 02:59 p.m. Updated: April 24, 2015 at 06:21 p.m. The 2015 NFL Draft is almost upon us, so die-hard fans and fantasy owners alike are waiting with baited breath to see who their team drafts. That got me to thinking, who is the best fantasy player drafted by each of the 32 current NFL franchises? Here's the parameters ... each player had to be drafted by and play most of his career with that team. So when you don't see Brett Favre or Marshall Faulk anywhere in the column, that's the reason. 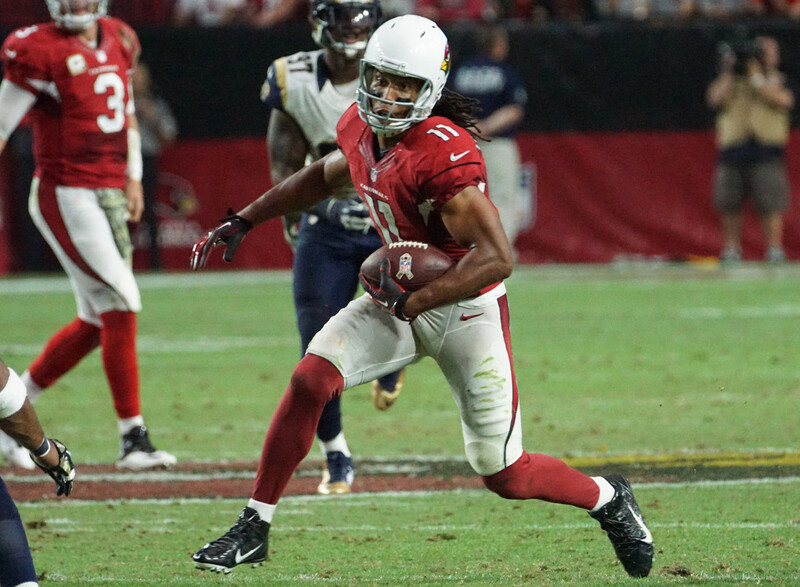 The leading wide receiver in Cardinals franchise history, Fitzgerald had long been one of the top fantasy football players at his position in the NFL. He's posted a combined six seasons with 1,000-plus receiving yards and has scored eight or more touchdowns seven times. Unfortunately for fantasy owners, Fitzgerald's numbers (and fantasy value) have experienced a very sharp decline in recent seasons. This was a close call between Ryan and Roddy White, but I'm going with the former. He's already the franchise's leading passer, throwing for 4,000-plus yards in each of his last three seasons. Ryan has also thrown 20-plus touchdowns in six straight years, including a combined 86 since 2012. This selection could become Julio Jones in the near future, as he's become a fantasy football superstar among wideouts. Lewis is one of just seven running backs in the history of the National Football League to record 2,000-plus rushing yards in a single season. Overall, he posted 1,000-plus rushing yards seven different times (five with the Ravens) and four seasons with at least seven touchdowns. During his most productive stretch at the pro level, Lewis was a first-round lock based on his role as a true featured back. As a centerpiece of the then-revolutionary K-Gun offense, Thomas rushed for 1,000-plus yards in eight straight seasons and posted 1,800-plus scrimmage yards on four different occasions. He was a poor man's Marshall Faulk due to his skills as both a runner and receiver as well. I could have gone with DeAngelo Williams or Steve Smith Sr., but Newton has been a fantasy stud in three of his first four seasons at the NFL level. In fact, no player since 1960 has more fantasy points in his first three NFL campaigns. Sure, his numbers did decline last season ... but keep in mind that he came off ankle surgery, suffered a broken rib and lost most of his wideouts from the previous season. One of the greatest running backs of all time, Payton rushed for 1,000-plus yards 10 times and scored a combined 125 touchdowns during his illustrious career. In 1977, he put up an enormous fantasy season with 1,852 rushing yards, a 5.5 yards per carry average and a combined 16 touchdowns for the Bears. Had fantasy football been as prominent in his time as it is now, Payton would have been a surefire first-rounder. Ken Anderson and A.J. Green were also in the mix for the Bengals, but I had to side with Dillon based on both production and the fact that he was a running back (the most important fantasy position of his time). He rushed for over 1,100 yards in each of his first six seasons in Cincinnati and scored 48 touchdowns in that time. Dillon also has a huge fantasy season in 2004 with the New England Patriots. Brown would have been a major fantasy football superstar had it been popular in the 1950s and '60s, as he rushed for 1,000-plus yards seven different times during his Hall-of-Fame career. Brown, who also put up nine or more rushing touchdowns seven times, left the game in 1965 while still at the pinnacle of his position. The nine-time Pro Bowler was inducted into the halls of Canton in 1971 at the age of 35. The NFL's all-time leading rusher with 18,355 yards, Smith rushed for 1,000-plus yards in 11 consecutive seasons and was a massive fantasy superstar during his illustrious pro career. Smith, who also scored 175 combined touchdowns (165 rushing), was a surefire first-rounder in fantasy leagues in his time. Other Cowboys greats such as Tony Dorsett and Michael Irvin (to name a few) were also in consideration. How is this not John Elway? Well, the Baltimore Colts drafted the Hall-of-Fame quarterback in 1983 before trading him to the Broncos. Enter Davis, who rushed for 1,000-plus yards in four consecutive seasons including a 2,008-yard, 23-touchdown campaign back in 1998. While his NFL career was cut short due to knee injuries, T.D. was still one of the most productive fantasy running backs of his era. Calvin Johnson could be the top fantasy player drafted by the Lions when his career is all said and done, but at this point he's not yet on the same level as Sanders. The elusive Hall of Famer rushed for 1,100-plus yards in every season of his NFL career, including a 1997 campaign that saw him record an amazing 2,053 yards on the ground. Sanders also rushed for 11 or more touchdowns six different times. Favre (Falcons) and Ahman Green (Seahawks) were not drafted by the Packers, so neither qualifies for this piece. That leaves Rodgers, who has recorded five 4,000-yard seasons and has scored 32 or more total touchdowns five times since 2008. He has also finished no worse than second in points among all players in each of his last five full seasons at the NFL level, including first during the 2014 campaign. It's hard to argue against Johnson being the top-drafted fantasy player in Houston, as he's posted 100-plus receptions five different times in his career. The former Hurricane has also had seven 1,000-yard seasons, including back-to-back campaigns with over 1,400 yards in 2008-09 and 2012-13. If there has been one knock on A.J., it's that he scored eight-plus touchdowns just four times in 12 seasons. The Colts have drafted some great fantasy players, including Marshall Faulk, Edgerrin James and Marvin Harrison, but how can you go with anyone but Manning? He would be on the fantasy football version of Mount Rushmore if there were such a monument, as he's posted 4,000-plus yards a ridiculous 14 times while throwing for 530 career touchdowns. That amounts to 2,120 fantasy points in standard leagues alone! The franchise's all-time rushing leader, Taylor was a fantasy star when he was on the football field. Tabbed "Fragile Fred" in fantasy circles due to his proneness to injuries during the earlier part of his career, Taylor was still able to rush for 1,000-plus yards seven times during his 11-year career. Fellow running back Maurice Jones-Drew was also in the mix here, but the former Gator stills reigns for the Jags. You could argue Larry Johnson deserves to be in this space, and Priest Holmes was one of the great fantasy runners of his era too. However, Gonzalez was simply too good for too long to be ignored. He helped revolutionize the tight end position, and is the Chiefs' all-time leading receiver. Only one other tight end (Ozzie Newsome) can claim that for a team. He's a lock to be inducted into the Hall of Fame. It's hard to believe, but a total of 26 players were picked ahead of Marino in the 1983 NFL Draft (including quarterbacks such as Todd Blackledge, Tony Eason and Ken O'Brien.) He went on to become one of the biggest statistical superstars the NFL and fantasy football fans had ever seen, shattering records with his cannon right arm. His 1984 campaign remains one of the best ever for a fantasy quarterback. Fran Tarkenton and Randy Moss were both in the conversation, but how can you go against Peterson? He's rushed for 1,000-plus yards six times, including a huge 2,097-yard campaign in 2012, and has been a first-round pick in almost every fantasy league since he was drafted. Aside from the 2014 situation that cost him all but one game, Peterson has been about as good as it gets in the current fantasy era. Brady has been a statistical beast at the pro level, posting 4,000-plus yards seven times since 2005. That includes a 5,235-yard campaign in 2011. He also recorded one of the best fantasy seasons ever, when Brady recorded 4,806 yards and 52 total touchdowns in 2007. What's been even more impressive is that Brady hasn't had what you would call an elite wideout (outside of Moss) during his illustrious career. Drew Brees was drafted by the San Diego Chargers way back in 2001 and doesn't qualify for this spot, so I picked Colston over Deuce McAllister because he has a longer track record. A seventh-round pick and the true definition of the term "sleeper," he's already the Saints' all-time franchise leader in receiving yards. In fact, he's recorded 1,000-plus yards in six of his nine campaigns at the pro level. Barber's career didn't start off well, as he failed to rush for more than 600 yards in each of his first three seasons. In the end, though, he became the all-time leading rusher in Giants' franchise history. Barber rushed for 1,000-plus yards in six of his last seven seasons and recorded 2,000-plus yards from scrimmage in each of his last three years for both Big Blue and fantasy football fans. Jets fans might disagree, but their team has not drafted a lot of players who turned into fantasy stars. Curtis Martin was drafted by the Patriots (1995), Don Maynard by the Giants (1958) and John Riggins had most of his statistical success as a member of the Washington Redskins. That leaves Namath, who was not a great fantasy player but still holds franchise records in passing yards and touchdowns. One of the greatest running backs of all time, Allen recorded six seasons with over 1,100 scrimmage yards as a member of the Raiders. He was also a touchdown machine, scoring 144 times (sixth-most in NFL history) during his career between the Silver & Black and Kansas City Chiefs. His 1985 campaign, when he totaled 2,314 scrimmage yards and 14 total touchdowns, was one of the best at his position during that era. Eagles fans clamored for their team to draft Texas running back Ricky Williams, but the franchise decided to select McNabb instead. It turned out to be a productive (and the right) move, as McNabb finshed as the top passer in franchise history. His versatile skill set also made him a solid starter in fantasy leagues, as he was ranked in the top 10 among signal-callers for a good portion of his career. The Steelers have had a number of great "drafted" players both on the field and from a fantasy football perspective, but Harris is the best of the bunch. Not only did he rush for over 1,000 yards eight times during his Hall-of-Fame career, but Harris also scored 100 touchdowns. The former Nittany Lion would have been selected in the earlier rounds in most drafts had fantasy been popular in his era. The Bolts have had more than their share of statistical superstars over the years, including Dan Fouts and Kellen Winslow, but Tomlinson is the best of the best. Not only did he put up the single greatest fantasy season ever at any position (2006), but L.T. was almost always a top-five pick in drafts. A surefire Hall of Famer, he is one of the greatest fantasy runners of all time. This is the biggest no-brainer in this entire column. Sure, the Niners have had a boatload of awesome fantasy options through the decades, but Rice was the best wide receiver to ever play in the league ... and you can argue that it's not even close. He's still the NFL's all-time leader in receptions, receiving yards and touchdown catches. Rice was also a fantasy superstar during his time in the Bay Area, posting a number of quality seasons with the Oakland Raiders. Even though Hall-of-Fame wide receiver Steve Largent played his entire career in Seattle, he was actually drafted by the Houston Oilers in 1974. As a result, Alexander gets the nod here. The 2005 NFL MVP had five straight seasons with at least 1,100 rushing yards and 16 total touchdowns. He was also a virtual lock to be selected in the first round of most fantasy drafts during much of his pro career. Steven Jackson is the all-time leading rusher in Rams history, but that's only because Dickerson was dealt to the Colts after just over four seasons with the franchise. During his time in Los Angeles, the Hall of Famer rushed for 1,800-plus yards three different times and scored 58 total touchdowns. Overall, Dickerson rushed for better than 13,000 yards and found the end zone a combined 96 times. As you can imagine, there haven't been a whole lot of fantasy superstars during the course of Buccaneers history. Steve Young was picked by the franchise in the 1984 supplemental draft, but his best times for fantasy fans came in San Francisco. Wilder, who leads the franchise in rushing yards, put up over 1,000 yards twice before a massive workload ultimately led to his career (and statistical) downfall. Drafted by the Houston Oilers (man, I miss those uniforms), George went on to become a statistical hero and fantasy superstar during his time with the franchise. He rushed for 1,000-plus yards in seven of his eight seasons between the Oilers and Titans and finished with 78 touchdowns. Much like Wilder, a huge workload led to George mostly breaking down in the stat sheets after the 2000 campaign. As I mentioned earlier, Riggins was drafted by the Jets and doesn't qualify for this column as a member of the Redskins. That leaves Monk, who retired as the franchise leader in receptions and receiving yards during what was a terrific Hall-of-Fame career. During his 14 seasons in D.C., Monk recorded 888 receptions, five different 1,000-yard campaigns and found the end zone a combined 65 times.